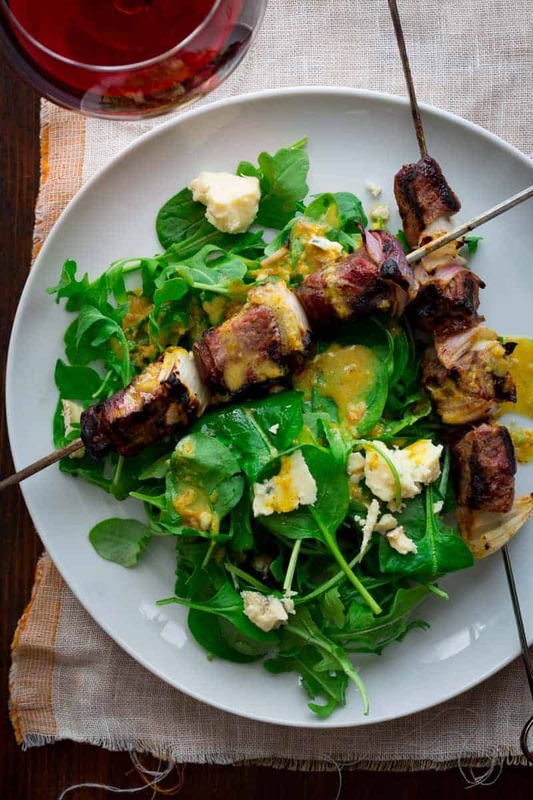 Healthy Seasonal Recipes — Spinach Salad with Steak, Onion, and Date Kebabs – Start R.I.G.H.T. Puree orange juice, zest, oil, shallot, vinegar salt, pepper, and Dijon in a blender or mini prep food processor. (Alternatively whisk in a bowl. )Reserve ¼ cup dressing and refrigerate. Drizzle the remaining dressing over the steak, onion and dates in a medium bowl and toss to coat. Preheat grill to medium-high heat. Thread steak, onion and dates onto 8 skewers, alternating. Oil grill rack. Grill skewers, rotating often until the meat is medium rare and the onions and dates are softened, about 8 to 14 minutes. Divided spinach and arugula among four plates or pasta bowls. Top with the skewers. Drizzle with the reserved dressing (about 1 tablespoon per salad) and top with blue cheese. Fiber: 4 g. Carbs: 24 g. Protein: 32 g. Sodium: 812 mg. Sugar: 16 g.